Breastfeeding in public can be stressful, especially for new mothers. And not all establishments are supportive. 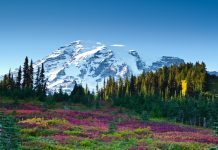 Washington State law protects a woman’s right to breast-feed in public, and federal law supports breastfeeding in the work place. Both state and federal laws dictate that bathrooms are not acceptable locations for breastfeeding, however. In a comfortable room at the back of the shop, Rachel and Curtis teach classes for moms and dads in breastfeeding and childbirth education. They also run support groups for breastfeeding, lactation, cesarean support and baby-wearing. Recently, it also became the temporary meeting place for the Lewis County Breastfeeding Coalition. “As a coalition we are very sensitive to education for the whole family, not just moms,” Rachel says. “We help breastfeeding moms know their rights in the workplace and in public.” She shows me a blue sticker in her shop window, an illustration of a breastfeeding family. 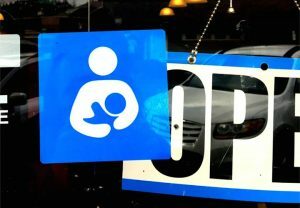 “Businesses can put this sticker on their front door or window to let people know that it’s a breastfeeding-friendly location. A nursing mother will then know that she won’t be harassed in that shop,” Rachel suggests. August is National Breastfeeding Awareness Month and coalition members are working hard to spread the word. 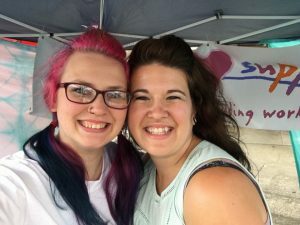 Recently, they set up a booth at the Community Farmers Market in Chehalis where they provided information and held a raffle. 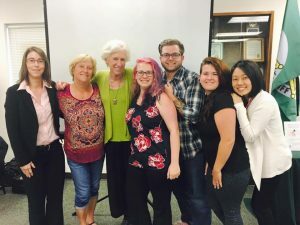 “The great thing about the coalition is that it’s getting resources and community members together to bring awareness for the importance of breastfeeding. If you’re a mother or a parent who’s interested in breastfeeding, or a relative who’s supportive of breastfeeding, we’re here for you. We’ll stick up for you if you need help,” Rachel explains. Breastfeeding in the workplace is another important issue for the coalition. Most women in Lewis County work, and although some jobs provide maternity leave, others require women to go back to work after as little as three days. The breastfeeding coalition educates employers about the benefits of women breastfeeding on the job. There are many advantages. For example, breastfeeding mothers have healthier children and take less sick days. They also tend to be happier at work. “We have a training module for employers describing what an appropriate space looks like for breastfeeding because you can’t just tell a mom to pump in the bathroom; that’s against the law. You have to provide a reasonable space with access to power,” Rachel suggests. Many employers have never considered the issues associated with having a breastfeeding mother on the job. The coalition helps business owners understand their rights and responsibilities to nursing mothers. 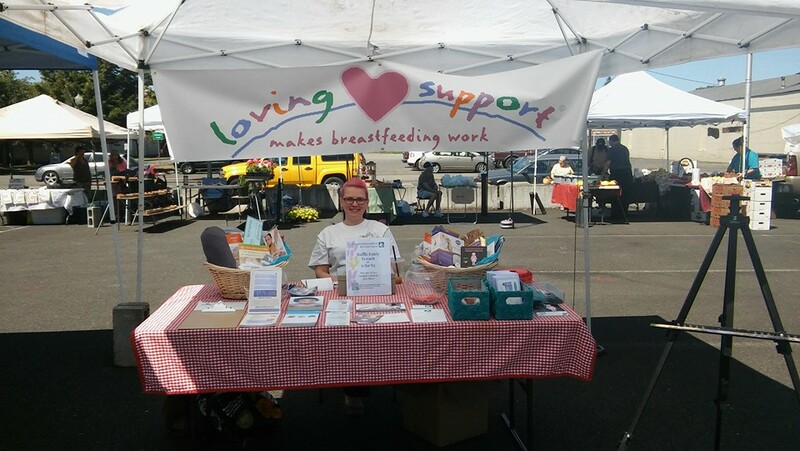 The Breastfeeding Coalition of Lewis County meets on the second Tuesday of the month at noon at the North Star Boutique, 1728 S Gold St. in Centralia. Meetings are open to the public. To learn more about Rachel and Curtis’ classes and support groups for parents, go to the Compass Birthing Services website or call 360-269-5563. You can also follow them on Facebook and Instagram. Contact them also if you would like to get a breastfeeding-friendly sticker to put on your business’ door or window. More information can also be found on the Breastfeeding Coalition of Washington website and the Breastfeeding Coalition of Lewis County website or Facebook page.